The use of smokeless tobacco has been increasing over the last decade in the United States. Smokeless tobacco is a risk factor of cancer of the oral tissues and pharynx, oral soft tissue lesions (eg, leukoplakia), periodontal disease, gingivitis, caries, halitosis, tooth loss, tooth stains, and nicotine addiction, and it has been associated with low–birth-weight babies and pancreatic cancer. A thorough history, including an assessment of the risk factors, and a careful examination of the oral cavity are the most important clinical tools in diagnosing oral lesions. Indirect pharyngoscopy and laryngoscopy may be performed to help visualize lesions of the throat, base of the tongue, and larynx. If a lesion is suspicious for an oral cancer, incisional biopsy should be performed for histologic confirmation. To reduce the risk of progression to oral cancer, smokeless tobacco use should be minimized, with cessation encouraged. Biopsy should be performed on lesions of erythroplasia that are suggestive of cancer based on their appearance or location in the oral cavity or those that have failed to resolve within 2-3 weeks.vPremalignant lesions and carcinoma in situ (CIS) may be permanently cured after excision or biopsy. Primary and invasive squamous cell carcinoma are treated with varying combinations of surgery and/or radiation. Studies from the United States report high rates of gingival recession in smokeless tobacco users, and, ultimately, periodontal disease and bone loss. There appears to be an association between the quantity of smokeless tobacco used and the severity of disease. Periodontal pathology is most likely related to long-term use of smokeless tobacco and is more typical in adult populations than in teenagers. However, although gingival and periodontal inflammation and bone damage can clearly be seen in association with smokeless tobacco use, there have not been studies that have been able to eliminate confounding factors such as the use of other forms of tobacco, preexisting periodontal disease, or other systemic diseases such as diabetes that may affect oral hygiene. Dental caries have been associated with the use of loose-leaf chewing tobacco, and studies have observed that the amount of dental caries has been shown to increase with the amount of chewing tobacco used. Other studies have found a minimal relationship between the two factors, and it has been speculated that the relative lack of dental caries may be secondary to the accelerated salivary flow the tobacco stimulates, which washes away the bacteria that induce the formation of the caries. 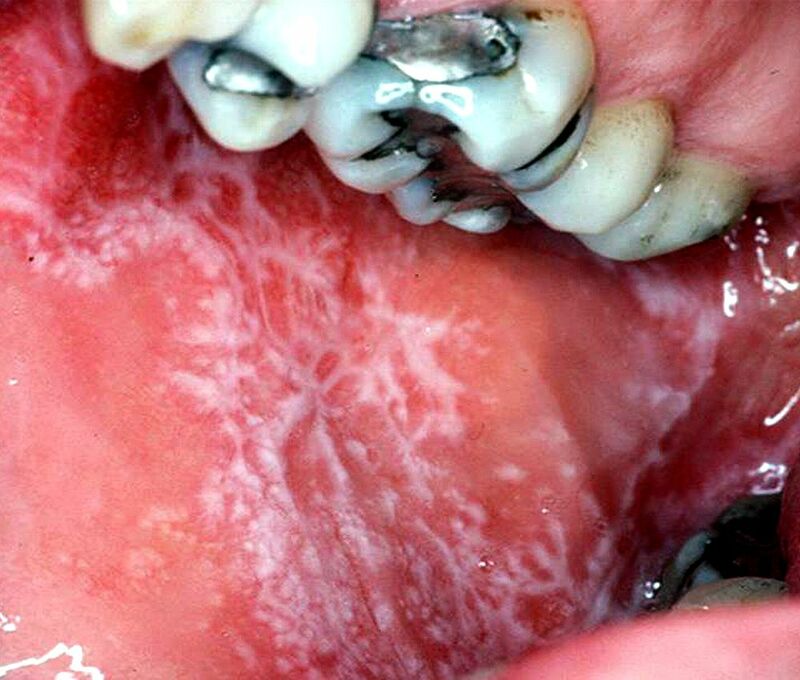 Oral leukoplakia (white plaques) is a common physical finding in 40-50% of people who use smokeless tobacco. Oral leukoplakia is a premalignant lesion, with the risk of malignant transformation to oral cancer varying in relation to the product used. In relation to snuff products, differences in the tobacco species, fermentation processes, nicotine content, tobacco-specific N -nitrosamines content, and pH may account for the differences in the reported risk. With most products, the risk appears quite low, whereas toombak dipping (a regional term for snuff) has been associated with a high incidence of oral cancer in the Sudan. Oral leukoplakia has been shown to regress in as few as 6 weeks with smokeless tobacco cessation. Note the image below. Erythroplasia (ie, erythroplakia, red plaques) is associated with severe dysplasia or malignancy in 80-90% of cases. Because of the high malignancy rate, the threshold for histologic evaluation of erythroplasia should be low. Speckled leukoplakia Speckled leukoplakia is much less common than either leukoplakia or erythroplasia and is distinguished, as the name suggests, by a speckled appearance. Carcinoma in situ may manifest clinically as leukoplakia, erythroplasia, speckled leukoplakia, or tobacco-associated keratosis. Squamous cell carcinoma (SCC) may arise in areas of oral or speckled leukoplakia, erythroplasia, or verrucous carcinoma. More than 80% of patients with oral SCC smoke, although those who smoke pipes or cigars are at the greatest risk. Overall, SCC accounts for more than 90% of all oral cancers. Verrucous carcinoma (also known as snuff dipper's cancer) is a type of low-grade, slow-growing, exophytic SCC that arises from regions in the mouth where smokeless tobacco is consistently placed. Lesions rarely metastasize but may recur, and, rarely, they transform into invasive SCCs. Although verrucous carcinoma is not the most common oral lesion found in users of smokeless tobacco, most cases of verrucous carcinoma are diagnosed in habitual users of smokeless tobacco. Note the image below. The prognosis of smokeless tobacco lesions varies widely depending on the type of lesion, stage of detection, and extent of involvement of the oral cavity and airway. The survival rates are 90-100% for small carcinomas in the hard palate, on the upper part of the gingiva, on the floor of the mouth, and on the buccal mucosa. Moderately advanced lesions without spread to the lymph nodes are associated with a local control rate of as much as 80%, whereas posterior cancers that appear late are associated with a survival rate as low as 30%. Leukoplakia is benign, while invasive SCC metastasizes via lymphatic spread, usually to the cervical lymph nodes. Decreased survival rates from smokeless tobacco use are not likely due to oral cancer alone but include many other causes of morbidity and/or mortality. Small studies in specific ethnic populations have shown an increased risk of cardiovascular disease.